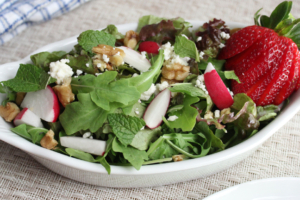 This beautiful spring green salad is crisp, bright and delicious! It’s got the flavors and colors of springtime with a great crunch in each bite. The best part is that it is so simple to throw together, but looks impressive on the table. It’s a fantastic way to make your farmers-market-finds shine. 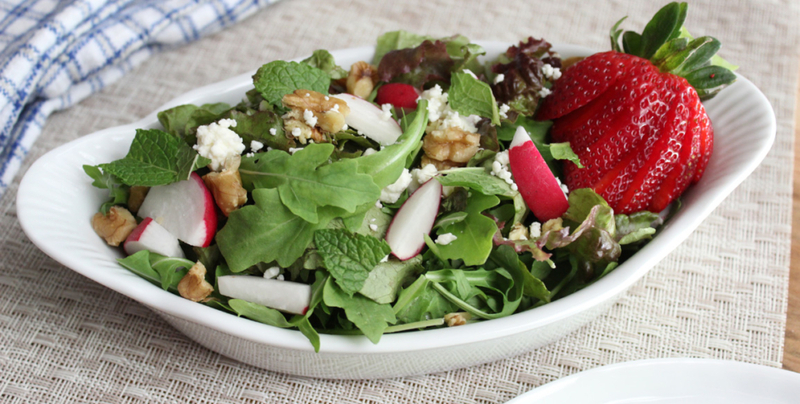 The buttery lettuce and walnuts complement the peppery arugula and radishes, while the mint and strawberries add in freshness throughout. Dress with a simple lemon vinaigrette and you’re all set. It serves as a perfect side dish, but you could also top it with your protein of choice (fish, chicken, eggs, tofu), add a delicious roll on the side, and have a complete meal ready to go. Combine all ingredients in a large bowl, toss with dressing, and serve immediately.